Cozymole sell a large range of waterproof trousers specifically designed for kids of all ages. We have both insulated and non-insulated ranges in stock from leading manufacturers in a range of styles including practical dungarees with matching jackets. All of the ranges we supply are 100% waterproof, using the best quality materials, and are all machine washable. Highly waterproof, fashionable and excellent value for money, KoziKidz waterproof trousers have a number of features which make them great for keeping your kids safe and warm. 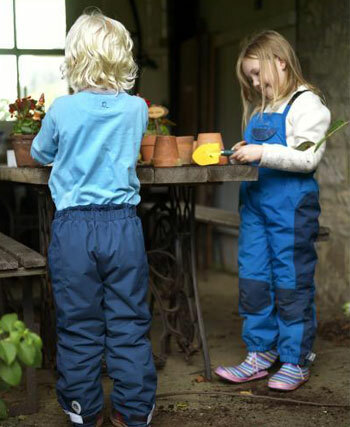 Designed in Sweden to take the worst the British weather can provide, KoziKidz waterproof trousers are available as a dungaree design, which allows increased protection from the elements. Berghaus supply a specialist children's range of waterproof trousers which are both light and breathable, yet provide both comfort and wear resistance. All fastenings are high quality and with Berghaus' Aquafoil® fabric you can rest assured that your child willl stay warm and dry. Berghaus developed Aquafoil® as it's own high performance shell material, which has breathability even at the most active level of use. The outer layer of this material acts as a very effective barrier for the ingress of water from outside, whilst allowing the escape of perspiration. Cozymole supply a great range of Spotty Otter dungarees and trousers which have waterproof and breathable outers, come in a range of attractive colours and are very tough. Featuring fully taped seams, mesh lining and adjustable braces, these great looking kids waterproof trousers are a real hit with children of all ages, from babies right through to 8 years. Available with or without fleece lining. Tough, durable and ready to take on whatever your kids can throw at them, Muddy Puddles waterproof trousers for kids are also washable, meaning you need not worry about the inevitable mud splashes and grass marks. All seams are taped, so no need to worry about leaks, whilst the generous cut of all legs and seat of the Muddy Puddles range means that your kids can move around easily without any rubbing. Muddy Puddles waterproof kids trousers are machine washable using non-bio powder, so are easy to look after. Cozymole supply waterproof trousers for children of all ages, along with jackets, dungarees and in some cases matching wellies. Give us a call to see what we can do for you.